Italians are famous for many things, a certain red car with a prancing horse, a demonstrative and passionate attitude, and delicious food that is enjoyed the world over. Speak to virtually any Italian, and you will see that passion and enthusiasm spill over at the mention of food, with Prosciutto being one of the favorite dishes served across the homes of Italy on a daily basis. Prosciutto is a specially prepared Italian dry-cured ham, that is normally sliced very thinly and then served uncooked. Prosciutto evokes a lot of passion and even competition amongst the regions of Italy, with different variations of the dish, perhaps the two most famous and well known are Prosciutto Di Parma PDO and Prosciutto di San Daniele PDO. Each variant reflects the flavors and characteristics of the region where they are made, and there are clear and distinct differences in the flavors, so it is certainly worthwhile experimenting a little to see which variety is more suited to your palate. 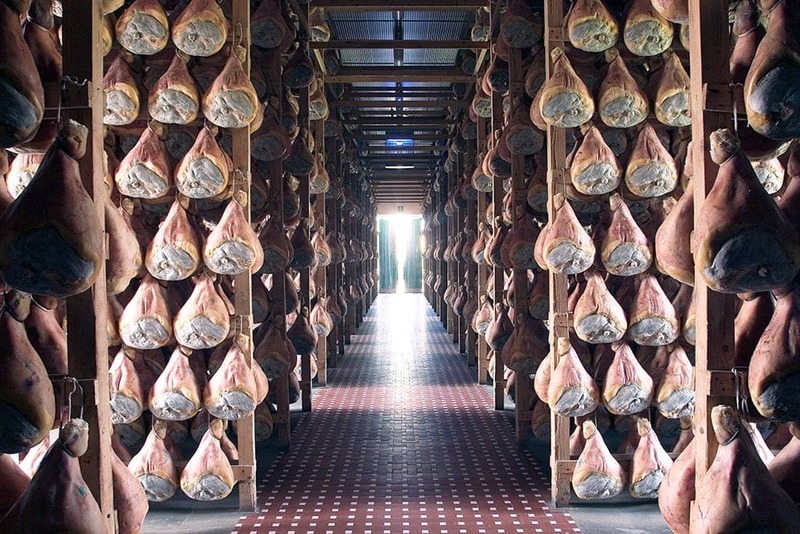 Prosciutto is not only one of the most famous Italian foods, but it is also one of the oldest. Records show that as far back as pre-Roman times, in the San Daniele region of northern Italy, Celtic people began to master the art of curing meat with salt. Interestingly in the Parma region, the local poor people or peasants depending on how you care to refer to them were the leading proponents of Prosciutto. The process of creating Prosciutto today has barely changed in all those years, and when you taste the melt in your mouth prosciutto, it is easy to see why. After all, why tinker with perfection? Prosciutto is made using only the hind leg, or thigh of a pig. The process takes a considerable period of time, anywhere from nine months to two years in fact. The first part of the process involves ensuring that the meat is totally clean, before applying liberal amounts of salt. The salted meat is now stored in a cold environment which is closely monitored to ensure that the optimum conditions are maintained at all times. The main purpose of applying salt to the meat is to remove any blood and moisture that was left behind after the cleaning process and to inhibit the growth of any bacteria. Once the two month period is complete, the salt is removed from the meat, which is then left to dry or cure for anything up to a period of 18 months. As you can see, the entire process is both lengthy and very carefully adhered to, but entirely necessary to give the meat that taste we have all come to appreciate. The various types of food created across the world, are very important to both the culture of a region or country, and to the financial aspect. 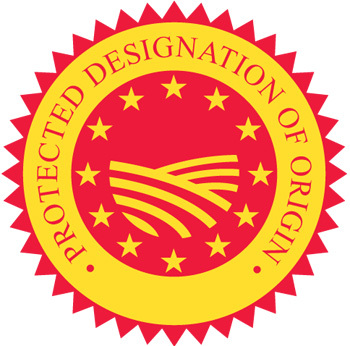 The European Union realized this and introduced the Protected Designation of Origin Policy. The purpose of this policy was to ensure that only products produced in specific regions were allowed to bear the name of that region. This not only provides some protection for the region but from a customers perspective gives a guarantee of quality and an assurance that the specific product comes from a legitimate source. Not every food type qualifies for this protection, but in regards to Prosciutto, Prosciutto di Parma, which unsurprisingly is made in the Parma region and Prosciutto di San Daniele from the San Daniele Del Friuli area of Italy, benefit from this protection. Before discussing the best way to eat prosciutto, if you are keen to experience the ultimate taste experience, then ensure that you buy your Prosciutto fresh, and by fresh I mean that you should witness it being sliced from the leg when you purchase it. It may be very tempting, and even convenient to buy pre-sliced and packaged Prosciutto, but it will never taste as good, and it also reduces your opportunity to have the meat sliced specifically to your taste, i.e. the thickness of the slices. To eat Prosciutto authentically, do not be tempted to use any cutlery, eat from the tips of your fingers, as this will ensure that the flavor and aroma remain intact. Do not remove it from the paper that it was sliced in unless your preference is to eat it with some mozzarella di bufala. Of course, the Italians are also experts in producing beautiful bread, and prosciutto placed in between pieces of bread, often referred to as a panino, is another delicious and tasty experience. Check out also other types of salami which can be a good way to integrate prosciutto. What Is The Difference Between Prosciutto and Pancetta? Many people often think that Prosciutto and Pancetta are the same product, but there are clear and defined differences. Pancetta is the Italian version of what Americans refer to as bacon, and this is where the most startling difference becomes apparent. Prosciutto is only made from the hind leg or thigh of a pig, whereas Pancetta is cut from the pork belly, which incidentally is also the part of the pig where bacon comes from. Unlike bacon, which is predominantly smoked, Pancetta is normally cured with the use of salt and spices, and generally, has a much more subtle flavor than bacon. Pancetta is generally a pale red or pink color and contains streaks of fat. When preparing pancetta for eating nearly all recipes call for it to be cooked, which is another key differentiator to that of Prosciutto, which is rarely if ever cooked. Pancetta is also rarely eaten on its own in Italian cooking; normally it is used to add flavor to a stew or perhaps a pasta sauce, or alternatively, it is used to wrap around meat and poultry. When it comes to seasoning meals that contain either of these two types of meat, bear in mind that they are cured using salt, so don’t fall into the trap of adding too much salt during the preparation process. Prosciutto is sold in two varieties, Cotto which is cooked, and Crudo which is raw. As mentioned above due to the seasoning processes used in the production of Prosciutto, there is no reason why this meat cannot be eaten raw, and that is the way the majority of it tends to be consumed. Prosciutto is cut into very thin slices, leading to a tendency for it to dry out very quickly. Never buy any Prosciutto without first asking for a taste. The color of the meat should be pink, and have a sweet taste, with a hint of salt. 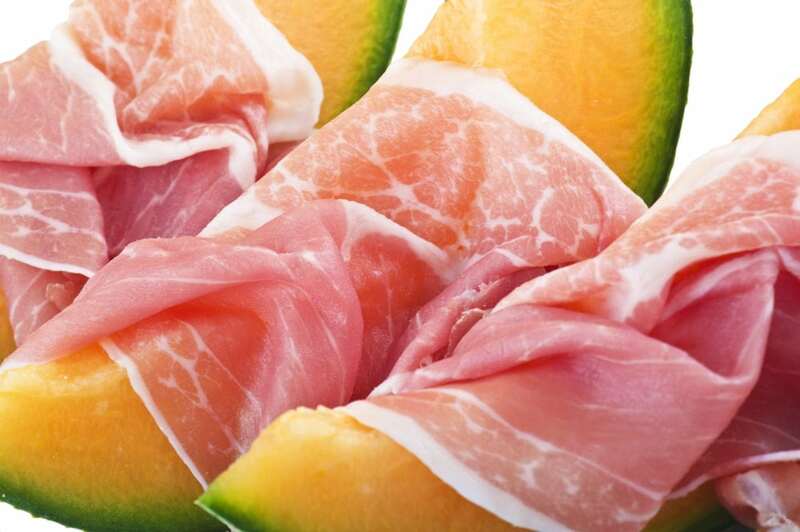 Prosciutto is regularly served as an appetizer, accompanied by melon or asparagus. What is the Nutritional Value Of Prosciutto? Unfortunately, in a twist that always seems to apply to delicious tasting food, when it comes to calories at least, Prosciutto doesn’t fare particularly well. In an average serving of 80g of the meat, the calorific content is equivalent to about 200 calories, which might not sound too bad until you compare it to something like tuna, which would have about 160 calories. As a consequence, Prosciutto is not as popular as it once was in sandwiches, and with health conscious shoppers. Furthermore, there is also a relatively high percentage of fat content in Prosciutto. If we stick with the 80g portion from above, then that would contain about 14g of fat, 5 of which would saturate. Saturated fat is not a healthy option, and anyone engaging on a diet should always be looking at ways of minimizing their saturated fat intake. And just when you thought it couldn’t get any worse Prosciutto also contains higher volumes of sodium and cholesterol than would be desirable. Regarding positive nutritional benefits, well, unfortunately, the news doesn’t get much better, as the meat contains virtually no dietary fiber and very little if any essential vitamins and minerals. 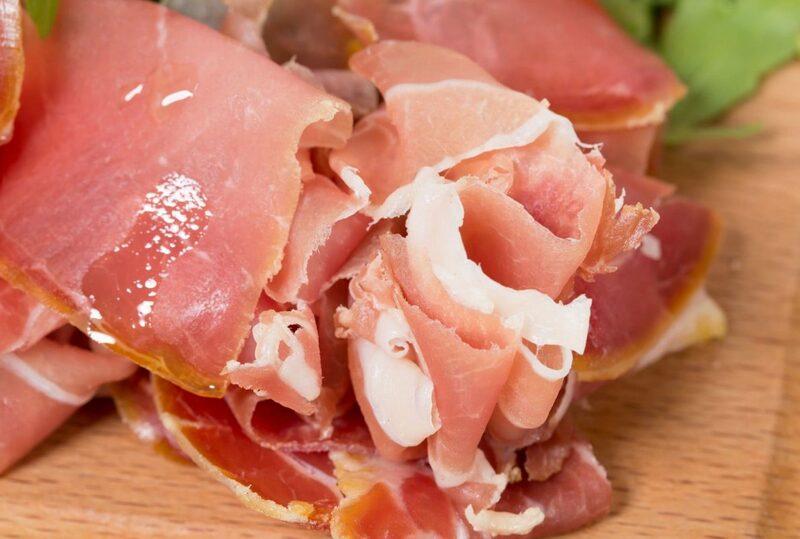 Although Prosciutto is clearly not going to win any awards for its health and nutritional benefits, there is nothing wrong with the occasional treat, and there are very few foods that shout Italian, quite as forcefully as Prosciutto. The good news is that Prosciutto is a totally natural food, that is gluten free, so if you are looking for a different type of taste or flavor to add some variety to your lunchtime meals, that is gluten free then Prosciutto may be the perfect option for you. Prosciutto is one of the oldest foods in the world and has been enjoyed by millions of people over the centuries. Although it could be argued that there are healthier alternatives in today’s market, provided it is consumed in moderation, there is no reason why anyone cannot enjoy the delicious taste of Prosciutto. Why Is Prosciutto So Expensive? Prosciutto can take anywhere up to two years to produce, and the entire production process has high-quality control measures in place to ensure that standards of quality are maintained. This obviously adds to the expense but ensures that the quality always meets your expectations.